September 9, 2009, Sacramento, Ca. United States Attorney Lawrence G. Brown announced today that BALLTAZAR VALLADARES, 30, of Roseville, was sentenced today by United States District Judge William B. Shubb to three years and one month in prison to be followed by three years of supervised release for interfering with the safe operation of an aircraft. VALLADARES pleaded guilty on June 8, 2009. This case is the product of an investigation by the Roseville Police Department, the Federal Bureau of Investigation, and the Federal Air Marshals Service. "These years in federal prison should give anyone pause when contemplating as reckless an act as potentially blinding a pilot who is operating an aircraft," stated U.S. Attorney Brown. According to Assistant United States Attorney Matthew Segal, who prosecuted the case, on March 16, 2009, a Southwest Airlines flight landing at Sacramento International Airport was hit by a green flashing laser light while flying over Roseville. Police dispatched to the area were unable to locate the source of the laser. 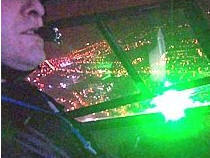 Approximately two hours later, the Sacramento Sheriff’s Department Air Unit STAR 5 flew over the area and was hit by a high-powered green laser. While the laser remained on the helicopter, STAR 5 flew in the direction of the light, coming within a 1/4 mile of the source of the laser. STAR 5 identified VALLADARES’s residence. Roseville Police officers arrived at the residence and spoke with VALLADARES. He admitted that he had been shining the laser into the sky during the night and that he had shined the laser at the police helicopter. During a search of the residence, police found the laser in two pieces hidden in different parts of the defendant’s room. The laser possessed by VALLADARES was seven times more powerful than the standards published by the Food and Drug Administration. High-powered lasers like the one used by the defendant have the potential to blind those who may look at it. As it concerns aircraft, the laser may interfere with pilots several kilometers away and can cause problems during critical phases of an aircraft’s operation, including takeoffs and landings. Judge Shubb, in sentencing VALLADARES, noted his long criminal history and his "apparently sincere indication to turn his life around." However, more important to the court was "the message that needs to be sent to others who might engage in this sort of conduct." Judge Shubb said that a "message has to be sent out" because shining a laser onto aircraft in flight is a "very serious problem," with "very, very serious consequences."